Like an epic taco, minus the mess. 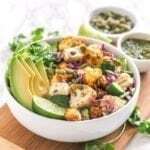 These Fish Taco Bowls with Chimichurri Sauce are loaded with roasted cauliflower, crispy cabbage slaw, creamy avocado, zesty lime and fresh chimichurri sauce. So good, you might just lick the bowl clean! Line a baking sheet with foil and toss the cauliflower in oil and spices. Roast on high at 400F for 30 mins or until crispy. Meanwhile, whirl all ingredients for the chimichurri sauce in the food processor and transfer to a small bowl or jar. It should have a dressing-like consistency, but shouldn’t be completely smooth. Whisk or shake the ingredients for the dressing in another small container. Chop the fish into small bite-sized cubes. Toss the pieces in the spices, then heat 1 tsp oil in a wok. Stir fry the fish cubes in the oil and squeezed lime wedges until cooked – about 3-4 minutes. Remove from the heat and keep warm. Prepare all remaining veggies as indicated. Toss them together (except avocado) in a few tbsp of cilantro lime dressing, then divide between 2 bowls. Follow with the avocado slices and cauliflower once ready. Top the cabbage slaw mixture with the cooked fish. Garnish with pumpkin seeds, cilantro and lime wedges. Spoon chimichurri sauce on top before serving.